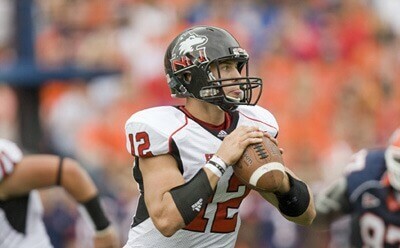 Chandler Harnish threw for 281 yards and three touchdowns in NIU's 50-14 win at Akron. Northern Illinois quarterback Chandler Harnish completed 16-of-20 passes for 281 yards and three touchdowns in three quarters and the Huskies used a 20-point outburst at the end of the first half en route to a 50-14 victory over Akron in the 2010 Mid-American Conference opener for both teams. NIU, which played on the road four times in its first five games of the season, won its second straight road game to improve to 3-2, 1-0 on the year. Akron dropped to 0-5, 0-1. Harnish hit Willie Clark on a pair of touchdown passes, of seven and 16 yards, and threw a 58-yard strike to Nathan Palmer for a score. His three touchdowns tied his career high, set in a 2008 win over Toledo. Harnish completed his first eight passes of the game. Northern Illinois scored three touchdowns in a span of 3:44 in the second quarter to take an insurmountable lead over the Zips. The Huskies scored their first touchdown and took a 16-7 lead on their fourth possession of the game on a drive that started from the NIU seven-yard line. With “big back” Cameron Bell handling most of the rushing load on the drive, Northern Illinois took advantage of a pair of Akron penalties and scored on Chad Spann’s three-yard run to take a 16-7 lead with 4:25 to go in the first period. After the NIU defense forced a three-and-out and a 24-yard punt, Northern Illinois marched 46 yards in six plays, with Harnish hitting Willie Clark on a fade route for the seven-yard score. The PAT was missed but the Huskies led 22-7. One play later, the Huskie defense extended Northern Illinois’ lead to 29-7 when Devon Butler picked off Akron quarterback Patrick Nicely at the 26-yard line and returned it for a touchdown with 41 seconds left in the half. NIU scored on nine straight possessions in the game and did not punt until less than seven minutes were left in the game. In addition to Butler’s interception, freshman Dominique Ware intercepted his first career pass. In addition to the efficiency of Harnish and the NIU receiving corps, which was led by Martel Moore with six catches for 85 yards, the Huskies ran for 228 yards. Chad Spann had 84 yards on 16 carries, while Ricky Crider added 63 yards on 11 totes, Cameron Bell ran for 42 yards on eight carries and Jasmin Hopkins contributed 29 yards on five runs. Kicker Michael Cklamovski totaled 14 points on three field goals and five PATs while also averaging more than 66 yards per kickoff. Northern Illinois was forced to settle for field goals on its first three possessions as Cklamovski was true on a pair of 27-yard kicks and a 43-yard try. The first field goal was set up a 47-yard completion on the game’s second play from Harnish to Moore to the Akron 11-yard line. The Huskies spotted Akron an early touchdown when Tommy Davis fumbled a punt return and Akron recovered on the NIU 11-yard line. Four plays later, Alex Allen scored on a one-yard run and the Zips took a 7-3 lead with 7:44 remaining in the first half. Akron scored its only other touchdown of the game on the first play of the second half when Allen broke free for a 74-yard run, but was tackled by Davis at the NIU one-yard line. He scored two plays later but the Northern Illinois defense controlled the Zips for the remainder of the game. Harnish completed his first eight passes of the game and had 103 passing yards in the first quarter alone. By halftime, he had amassed 202 passing yards on 13-of-17 passing. Northern Illinois returns to Huskie Stadium for three straight home games, beginning with an 11 a.m. meeting with MAC East favorite Temple next Saturday, Oct. 9. Tickets for the game are on sale through the NIU Athletics Ticket Office in the Convocation Center at 815-752-6800 and at www.NIUHuskies.com.